I was in Cuba before Obama. And I want to tell you all about it. Don’t expect a travelogue, though, or minute descriptions of places you may or may not visit. Nor particularly penetrating insight into Cuba at its time of transition so intense and painful, it reduces the Revolution to a prologue. Anyone who tells you they get Cuba, or know what’s going on there right now—lying, lying, lying. So, I’ll be lying a little too. It’s so tempting. Fortunately, I wasn’t alone, but with a cynical thirteen year old, an overly empathetic eleven year old and a guile-free six year old. So they’ll be calling me on most of it. Which is as it should be. And you get to experience it—as text, as pictures, and as sound. 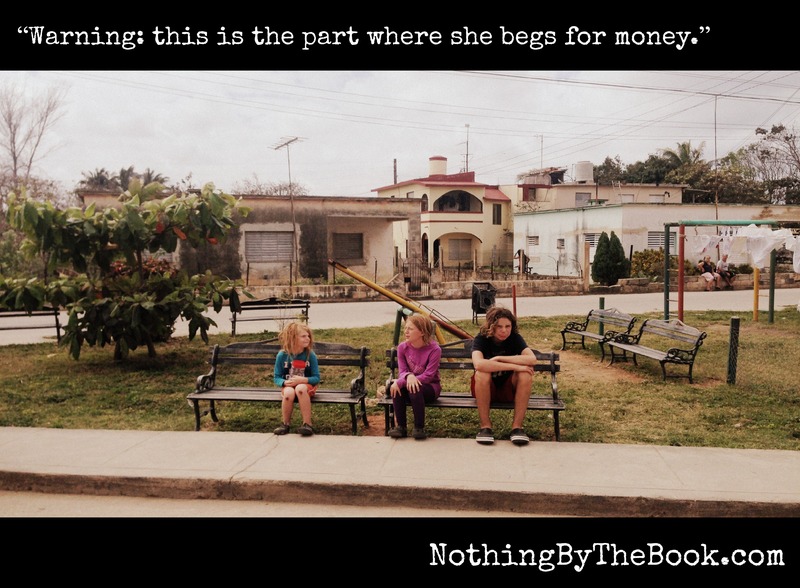 All the “postcards” will be hosted on the Nothing By The Book blog. There are 45 long-form postcards—essays, or almost traditional blog posts—each of which will also be released as a podcast, hosted on SoundCloud. Interspersed among them are 120+ mostly visual postcards (photographs), as well as an assortment of outtakes from the notebooks and sketchbooks I abused during my Cuba experience. What do you think? This is the first time I’ve ever released a work-in-progress. I am, frankly, terrified. But it’s good to work though fear, no? Series 1 of the Postcards is now fully live, and I’m spending the summer chasing the funds I need to release Series 2 and 3 in the fall. I’d love it if you were part of that process! The above link takes you to PayPal. If you’d like to make a contribution but have PayPal issues, email me at nothingbythebook@ gmail.com and we’ll work something out. Series 1 and 2 of Postcards from Cuba are now fully live. Check out the chronological table of contents, and read, listen, and enjoy. And… did you? Would you? Art evolves, and Series 2 combines images, podcasts and texts in each postcard. PfC: are you or have you ever been a member of the Communist Party?